Just wanted to let you know that my friends over at Better Body Foods are sponsoring this pie-loving post! If you want to share this recipe to your Facebook wall for later, click HERE! 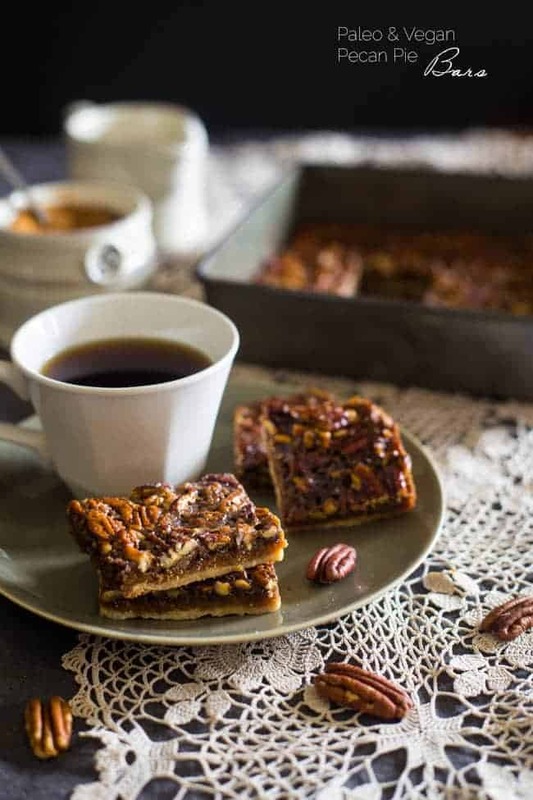 These paleo pecan pie bars are so easy to make and only have 6 ingredients. You would never know they’re a healthy, gluten free, and vegan-friendly treat! Perfect for Thanksgiving! Pecan pie comin’ at ya. Except, liiike, without all the annoying pie-crust making WORK. If that sounds like the kind of Thanksgiving dessert vibes that you want a piece of, then wave yer hands in the air like you just DON’T CARE. I know y’all hate recipes that involve 42 bazillion steps, so I should see a SEA of hands flapping around right now. You guys. 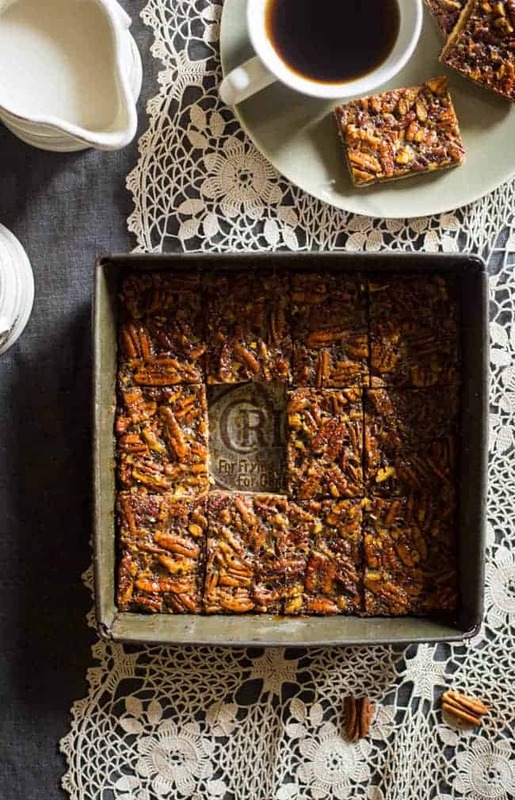 These Paleo AND Vegan Pecan Pie Bars are E-Z. No rolling. No messing around with chilled butter (actually no messing around with butter AT ALL) and no having to wait eleventy billion hours for your crust to chill before you can shove each chewy, crunchy and nutty-sweet bite into your pie-loving-faces. +++++ It’s the last recipe in the mini “Friendsgiving” series that I’m doing with Lindsay from “Cotter Crunch” and the superfab peeps over at “Better Body Foods.” You can check out the original quinoa salad to get DA SCOOP and enter an awesome giveaway of Better Body Foods products. AKA: Super tasty food that will make your body glow and feel healthy and stuff. Who doesn’t want that? NO ONE. Did you know it’s Thanksgiving like RLY RLY SOON? I mean, it’s basically upon us. It occurred to me that the only real “Thanksgiving type” food that we’ve been eating around here lately is side dishes. We’ve had SUPER easy gluten fee stuffing, Maple roasted Brussels sprouts and roasted Brussels sprouts with balsamic reduction. Yes, I realize that’s T-W-O Brussels sprouts recipes. I told you, I get stuck on one food for ever and ever and ever until I get sick of it. Which takes a LONG TIME. I know that you understand this. We obviously needed to get out Thanksgiving dessert on amIright? HI pecan pie bars! It also occurred to me that there are two kinds of people in the world: 1. Pie “Elitists” if you will. These are the people like your grandma. Who did not grow up with new and fangled things like E-Z pie bars. All these humans know is low carb paleo almond flour pie crust. AKA: hard work that I don’t like doing. 2. Everyone else. These people have discovered the joys of the Netflix binge, with impedes on the time required to make said pie crust. These people do not judge pie bars. These people? They are your FRIENDS. Which is why pie bars are the ULTIMATE nums for Friendsgiving feasting. 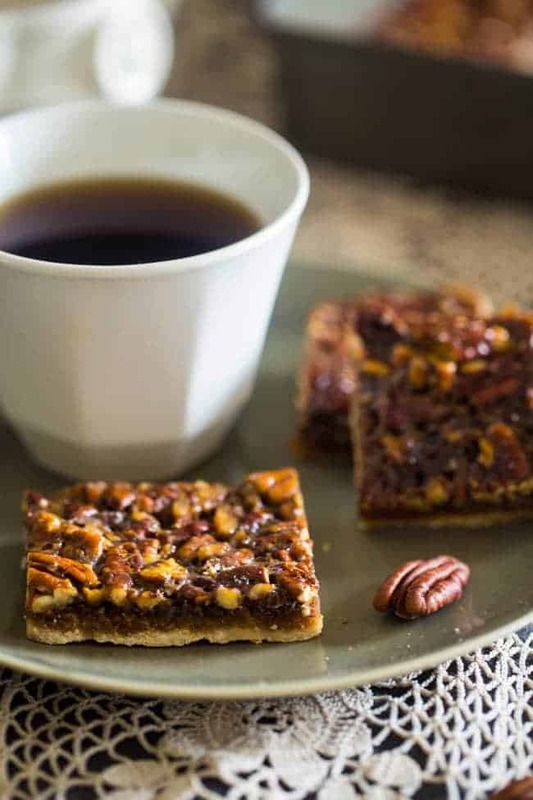 The whole crunchy, roasted nuttiness of the pecans mixed with chewy bites of thick, sweet coconut sugar and maple vibes all sitting on top of the world’s most perfect thin-n-crispy coconut flour crust doesn’t hurt either. Obvi the texture-obsessive-person that I know you are is totally freaking out. Crust. We need to lay down a few ground rules. Okay, like one ground rule but its IMPORANT: You mustmustmust whateveryoudo RESIST the urge to serve these bars warm. Your teeth will not sink through layers of chewy, sweet YUM into the most perfectly crisp crust ever. Your crust. It will be soft. 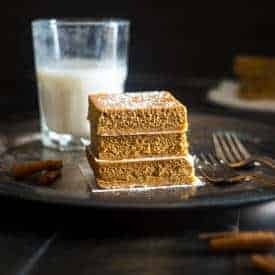 Just like the Paleo Lemon Bars, serving these bites of ultimate holiday-dessert goodness is a M-U-S-T. I’m watching you. Do it. Ohohoh! Also. Netflix is waiting, I KNOW, but spend the extra 5 minutes to pre-toast your pecans. ANNNND, pro-tip, watch them closely because they burn fast. So I’m told. I didn’t burn 3 batches of them or anything. Everything is hypothetical here. Aside from my bossy-pants ground rules, that’s IT. 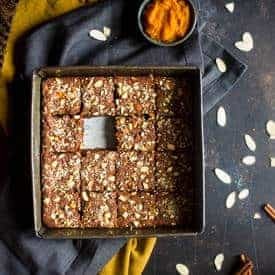 I’ll be sitting around my Friendsgiving table, virtually cheering you on for getting your priorities in line (ahem: watching Netflix) and coming over to the magical side of the S-U-P-E-R-E-Z and no-one-will-guess-they’re-healthy pie bar. 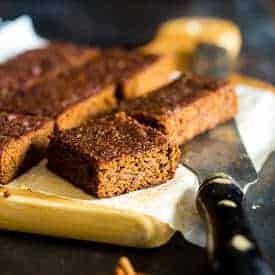 These paleo pecan pie bars are so easy to make and only have 6 ingredients. You would never know they're a healthy, gluten free, and vegan-friendly treat! Perfect for Thanksgiving! 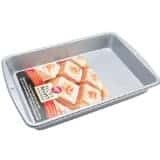 Heat your oven to 350 degrees and line the bottom of an 8x8 inch baking pan with parchment paper. Generously rub the sides of the pan with coconut oil. 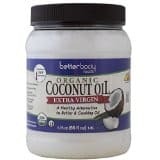 In a large bowl, beat the maple syrup and coconut oil together using an electric hand beater until creamy and well combined. Stir in the coconut flour and salt until it forms a dough. Press the dough evenly into the bottom of the pan and bake until the edges are a deep golden brown, and the middle is lightly golden, about 14-15 minutes. * Your crust will probably have risen and cracked a little bit when it comes out of the oven, use the pack of a large spoon to pack it down so it’s flat and crack-free. Let cool for 1 hour before starting the topping. Additionally, as soon as the crust comes out of the oven, whisk the flax meal with the warm water and refrigerate, so the egg can gel up for the hour that the crust is cooling. 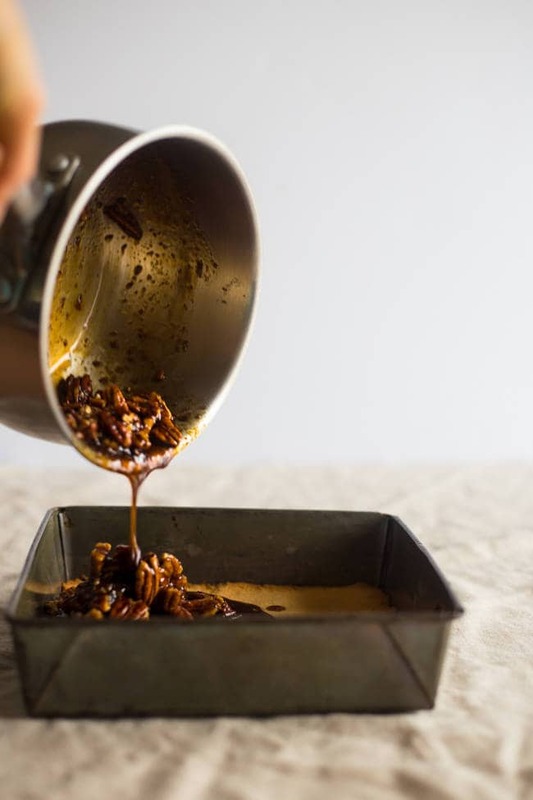 In the meantime, place the pecans onto a cookie sheet in a single layer and bake them into the oven until they darken and smell "nutty" about 8-10 minutes. Let cool and then roughly chop and set aside. Once the crust has cooled for 1 hours, combine the remaining coconut oil, maple syrup, coconut sugar and salt in a large sauce pan over medium heat and bring to a boil. Boil for one minutes, stirring frequently and then remove from heat. Let the mixture stand at room temperature for 5 minutes. Once it has sat, add the chilled flax eggs and mix well. Finally, stir in the chopped pecans until they are coated in the sugar mixture. Pour the topping over the crust, using a spoon to spread out and make sure the sugar mixture and pecans are evenly coating the crust. Press the pecans lightly so they lay flat. Note that you need to let the finished bars chill at LEAST 6 hours before serving! * Make sure the crust is nice and golden. You want it be really firm, or the topping will cause it to go soggy. **Make sure you give these bars the full amount of time to chill, as this is what hardens the crust. And serve these bars cold, not at room temperature or warmed up. **Since the topping is so sticky, it's a lot easier to slice these if you a run a sharp knife around the outsides of the pan first, before slicing into bars! Want more healthier, fall desserts? What would the holidays be without pecan pie, and in bar form? YES!!!! These look super yum, Taylor! They would be SAD, that’s what!! Glad you’re feelin’ the pie bars! Thanks Tori! These are brilliant, and I love that they’re easy. I’ll be making them all holiday season long to bring to the potlucks etc. Loving the lighting on these photos too my friend! 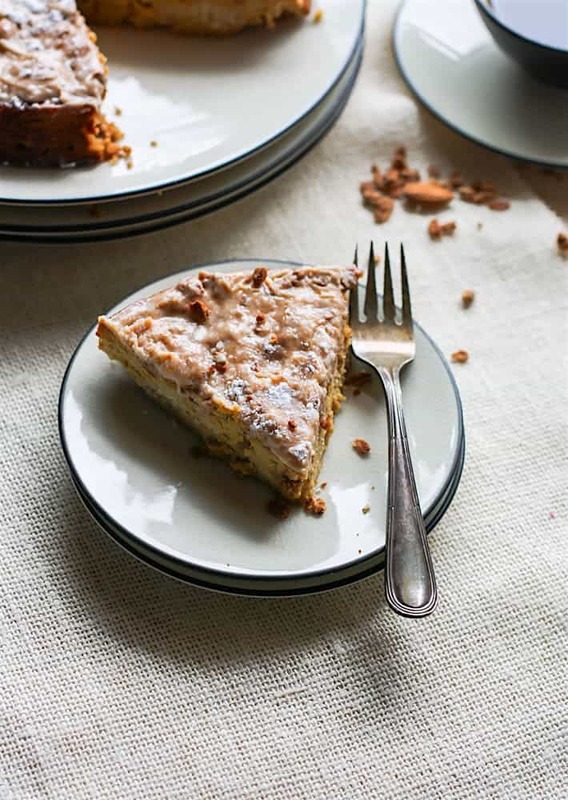 pecan bars and almond cake go together like two peas in a pod. YOU AND ME! haha. <3 it. Pinning, drooling, wanting! I wish I could send you some – thank you Catherine! Both hands, waving in the air, sister!!! ‘Cuz I just don’t care. Flap flap flap. Gorgeous dessert Taylor and love the BARS! Makes ways more pieces than slicing a pie. Absolutely love pecans, this is a real winner. Haha I love it, let’s wave our hands TOGETHER! Thanks for the pie bar love Allie! Yes to a simple pecan pie recipe thats not full of sugar and a million calories!! YESYESYES is right! Glad you approve! Thanks Bethany! Ok- these are like too easy not to make! I love pecan pie, but I am definitely not making a pie but THESE, these I could do. RIGHT! Pie is SO HARD and time consuming! I hope you love these bars Hayley – thanks! Hahah love it! Thanks Shashi! I hope she loves them! They say hi back 😉 Thanks girl! Haha YAY! My work is done 😉 Thanks Rebecca! I try 🙂 Thanks Julie! Love these bars, Taylor! and thanks for introducing me to Better Body Foods!!! You’re so welcome! Thanks Alice! Boy am I glad I found your blog! I love your entire theme. I have dabbled in the Paleo eating lifestyle most recently. I love this idea because it can be hard to find something that makes your belly happy without sugar. I am SO glad you found it too Nicole – it’s super great to have you here!! I totally agree, usually sugar free things taste well, YUCK. I hope these do the trick for you – please let me know if you try them! Pecan pie is my husband’s all-time favorite! Will definitely give your healthier version a try! Woo! I hope he loves it just as much! Thanks! These are paleo – yes! 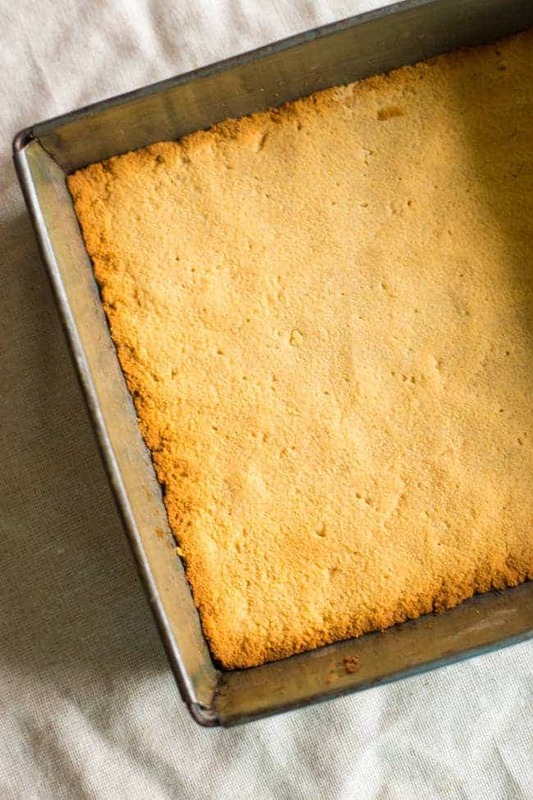 They look insanely good and will be made for my Paleo crowd this Thanksgiving. Yes, I hope your paleo peeps love them! Thanks Naomi! Confession: I’ve never had pecan pie. I know! But these. These I will have to try! Pinned! WHAT! You seriously need to change that! Thanks Lisa! 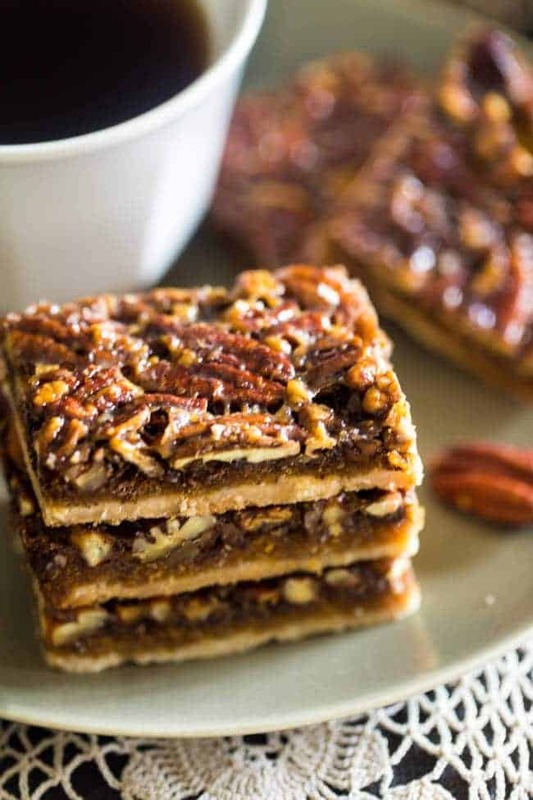 These pecan pie bars look To Die For! So Awesome! I’m all about a pecan BAR! they look perfect! 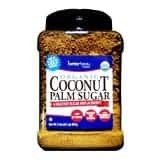 I have to try that coconut palm sugar, I keep seeing it! You MUST try it Aggie, you will love it! Thanks! Hooooow do you do it??? They are vegan and only 6 ingredients? Gah! Incredible. Pecan Pie is one of my absolute FAVE desserts of life!! Those look delightful! It’s one of mine too! So sweet and crunchy and perfect! Thanks lady! OMG these look amazing! I saw them on CotterCrunch and had to check them out! Hahha I admittedly spend too much time on Netflix but I do love me some pie. Just no time and these bars are perfect for those times! Netflix binges are just the best right?! Thank you lady! I love a press-in crust, so much easier! Right? The best! Thanks Sylvie! I’ve never been a huge fan of pecan pie, but these look wonderful! I’m especially loving the ingredients. Does the coconut flavor come out much in the bars? I feel like the coconut-based ingredients would give them a unique flavor twist and really bring them over the top. The coconut flavor actually doesn’t come out much! It gives it sort of a nutty taste, but it’s actually more on the caramel side! 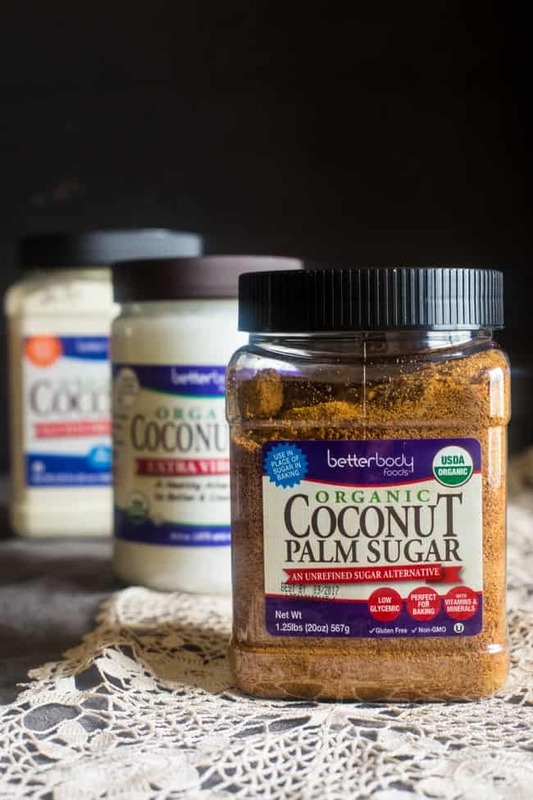 IF you’ve never tried coconut sugar, you must! It’s my fav! Thanks Margaret Ann! These bars look OFF DA HOOK! I’m drooling already and it’s 7am. Can’t wait to try these! Haha I LOVE your lingo! Thank you Christie! Yum these look delicious! Bars do sound easier than pie. I have been craving pecan pie lately…you read my mind! ha! Beautiful pictures! Haha I made these JUST for you Emily 😉 Thanks so much! RIGHT! The crust is just WAY to much work! Please let me know if you try them! Thanks girlfriend! Pecan pie is a must in my opinion at the holidays and I love that you took away the crust. It’s always a pain and turned it into bars. Just perfect! YES! It’s the most annoying thing ever right? Thank you Susan! My husband can’t tolerate maple syrup, molasses, or brown sugar. Sad, I know. Can I sub with honey or would you recommend something else? This is coconut sugar though, not brown sugar which is different. Can he have that? You could MAYBE sub with Honey, but honestly the Maple syrup adds to the flavor, and you definitely can’t sub the coconut sugar with anything else. I’m sorry! CAN I SUBSTITUTE SOMETHING FOR THE FLAX MEAL? THESE LOOK SO GREAT! Thanks! Hi Evelyn, I really can’t tell you for sure, as the recipe was not tested any other way. You could try 2 whole eggs, but I really can’t tell you if that will work I’m sorry! Please let me know if you try it! Hi Dian! I reallllly have to caution you with those subs, especially if you’re planning to just sub them straight 1 for 1. I REALLY don’t think that those ingredients will be successful, but please do let me know if you try it! Thanks! When I saw these on Finding Vegan I immediately knew we had to make them for Thanksgiving. They were simple and SO GOOD. I attempted to make a gf + vegan pecan pie a couple of years ago, and while it didn’t taste bad, it just wasn’t very similar to a traditional pecan pie (which I haven’t had in 8+ years). These bars though, these were perfect. My non-food-restricted family members absolutely loved them as well. They’ll certainly be a holiday staple from now on. Thank you! I have the crust baking in the oven. 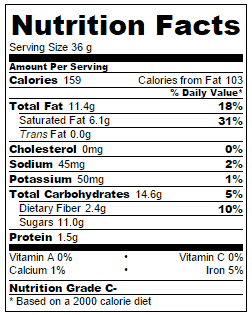 I am looking at the topping recipe, which says it is vegan (I am not vegan) and it mentions eggs, but they’re not listed in the ingredients. Very confusing and I’m serving it tonight. Talks about the eggs and flax/warm water jelling? Not sure if I should add 2 eggs, whole eggs or just part?? Can’t rate it because I’m still making it….. It talks about “eggs” because when you whisk flax meal and water together and let it sit, it makes what is called a “flax egg” in the vegan community! Just follow the directions, with no REAL eggs and you’ll be good! Hope that helps! Please let me know how you like it. Thanks! Totally good two days ahead of time!! Unfortunately, I can’t tell you about freezing as they were gone before I even got the chance to freeze them! Sorry! I THINK they would be fine though 🙂 Please let me know if you try them! Thank you for your quick reply. Just going to start making them with my daughter now 🙂 I will let you know how they turn out. This looks exactly like pecan pie, and I LOVE that you made it paleo. 🙂 I found it on Amanda and Arman’s link-up today! Would adding chocolate chips to this recipe make it too sweet? Do you think it would work the same if I used xylitol instead of the maple syrup? I really don’t think so – they are totally different textures and the maple syrup is what makes it the correct texture, I’m sorry! Thanks for letting me know Kristi! Oh Mary, it’s SO good! You’ll love it!! 🙂 Thanks! Has anyone successfully used whole eggs or “chia eggs” in place of the flax? I’ve made some cookies that have a filling based off this recipe, using eggs: http://www.foodfaithfitness.com/pecan-pie-paleo-cookies/ This might help you?? Wow… I love your images. I will make it for my family next weekend. I hope they love! Thank you! Taylor, wow. These look insane. I’m so excited they’re paleo- can’t wait to try the recipe! I hope you LOVE Monica! Let me know how they turn out! Wow!!! Perfect with a cup of coffee in the morning or with a cup of tea in the evening. Thanks for sharing this! Yes totally! You’re so welcome! Has anyone tried doubling this recipe? I’d like to make it for the holidays! I haven’t, but I’ll leave the comment around to see if anyone has! 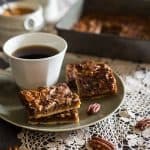 Thanks for sharing too easy pecan pie bar recipe. I’ve bookmarked your recipe for make the festival. I made these for a Christmas party last night and I loved them! I think the group was terrified of healthy so I had some leftovers to have with coffee this morning. I can’t bake if my life depended on it and these were so easy. I am SO glad to hear all of this! YAY! Thank you for letting me know! Hey Taylor! Do you think there’s a substitute for the flax egg in this recipe? I really want to make it! Hi Amee! You can PROBABLY use 2 normal eggs. BUT, I haven’t tried it this way so I can’t tell you for sure! Let me know if you try it! Hi, why do you have to cool the crust for 1 hour if it goes back into the oven again anyway? What would happen if you put the topping on the warm crust and baked it? It’s too soft and won’t set properly. Are we using raw pecans or pre-roasted pecans? If pre-roasted do I still need to roast in the oven? I used raw and then roasted them! If yours are pre roasted then skip roasting! Delicious! I love the hint of coconut that comes through from the crust. Thank you! I am SO glad you love them! Thank you! 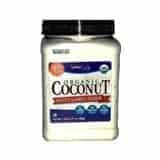 Any recommendations on a substitute for the coconut oil? I’m making these for someone who recently had yo change their diet to vegan and they also can’t have any oil. Maybe vegan butter? I just worry it wont chill as hard!